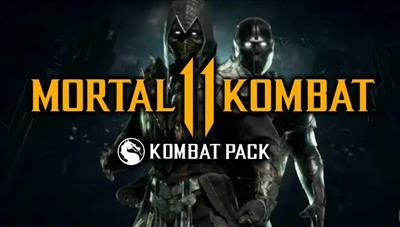 Erron Black is a new character in Mortal Kombat X. 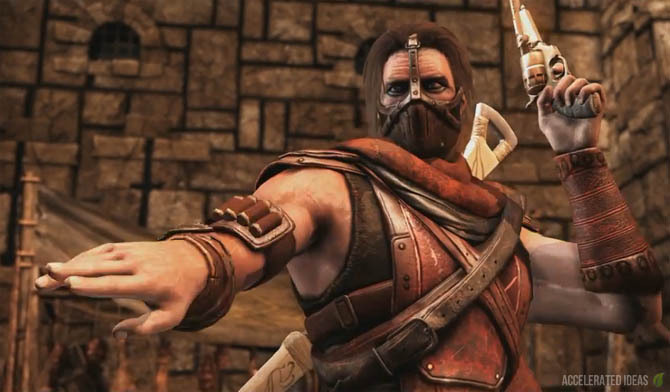 Known as a former mercenary in the comic books, Black is one of Kotal Khans most fearsome warriors and his allegiance lies with the Black Dragon. His three variations in MKX are Marksman, Outlaw and Gunslinger. Looking like your classic Wild West gunslinger, Blacks ultimate goal is to see to the destruction of Mileena once and for all. He relies heavily on his two pistols, which come into play as projectiles and melee weapons during combos. A slow moving low projectile. Black rolls the lightly coloured ball along the floor, which explodes at the opponents feet upon impact. The enhanced versions speed can be controlled and it also pops the enemy up for a combo starter. Black breaks the glass globe above his head as an anti-air defensive move. A medium range slide which knocks the opponent clean off their feet. The enhanced version contains a double pistol shot as the opponent flips up into the air. A medium range tackle, that takes the opponent to the floor. The tackle is automatically followed up with pistol shots to the opponents face. The enhanced (EX) version contains a final standing pistol shot that hits the enemy while they're still on the floor. Erron drops a handful of Caltrops (metal spikes) onto the floor which prevent the other player from dashing in. They also cause automatic (but very light) damage if the other player stands on them. In this variation Erron gains a rifle on his back which he uses for two extra projectile moves and a nice combo starter uppercut. Erron walks back slowly while firing the rifle weapon three times. The third shot causes the opponent to fall over. The enhanced (EX) version first one shot to the feet, one to mid height and the other slightly in the air. Erron crouches and aims his rifle before unleashing a single sniper shot. The player can hold and charge this shot (or cancel out with dash). Erron swings the rifle like a golf club, sweeping the opponent up into the air. Perfect for a combo starter. The enhanced (EX) version contains a rifle shot whilst the opponent is in the air, causing them to pop even higher into the air. In this variation Erron gains a sword weapon which he uses for combo attacks and special moves. The sword has great range, especially for poking and jabbing. Starting with a single stab move that pierces right through the opponent, followed by several mini stabs which end up breaking the sword in two. This causes some damage over time (bleeding) and you also lose the sword for several seconds afterwards. The enhanced (EX) version will cause more bleeding but also increases your time without the sword. A modified version of the Sand Grenade, Erron flicks a clump of sand into the opponents face, stunning the opponent for a moment. In this variation Erron utilizes his revolver for maximum effect. He gains a low pistol fire move, an anti-air defensive projectile and also a spinning double pistol shot. All three of these moves are blazingly fast. Last but not least, Erron also has a coin toss move which creates an angled projectile. 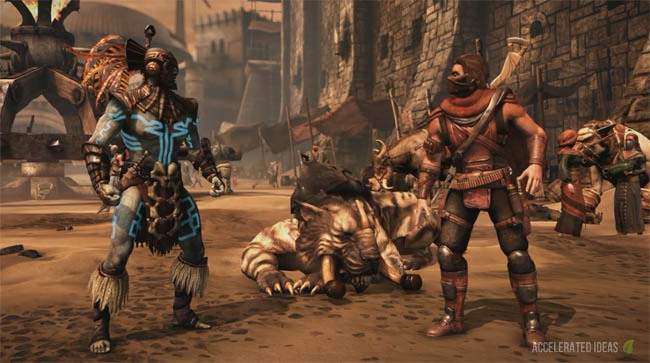 Erron fires several pistol shots at the opponents feet. He doesn't crouch during this move. While spinning away from the opponent, Black fires two pistol shots with each revolver. Erron Blacks X-Ray is one of my favourites. He throws a glass globe onto the ground, stunning the other player. He then fires a "magic" bullet with the opponents name inscribed on the side. The bullet travels through the opponents leg, then into the hip area and out through the neck. From mid range Erron throws a Sand globe into the opponents chest before shooting it. The after effect is a tidal wave of sand pouring out of the opponents body from all directions.